Fugitive Ma, who was wanted by the police for robbery, never imagined he would be apprehended while at a concert surrounded by thousands of people. The 49-year-old suspect was arrested while watching famous Chinese singer Jacky Cheung in Jinhua, east China's Zhejiang Province on June 9. A big Cheung fan, Ma had made the trip to Jinhua all the way from Shanghai and soon learned the true meaning of the saying, "nowhere to hide." "I would not have come here if I knew it [would end up this way]," sighed Ma when he was brought to the police station. According to the arresting officers, Ma was totally surprised and kept asking the police how they could identify him among the large audience. The secret behind the arrest is the artificial intelligence (AI) surveillance systems installed at the stadium where the concert was held. When Ma entered the gate of the Stadium of Jinhua Sports Center, facial recognition cameras picked him up by comparing facial features of concert goers to a criminal database. The information was then sent to the police for action. Actually, it was not the first time that a criminal suspect was spotted at Cheung's concerts. From April 7 to July 6, Cheung held five solo concerts in Nanchang and Ganzhou in Jiangxi Province, Jiaxing and Jinhua in Zhejiang Province, and Hohhot in Inner Mongolia Autonomous Region, and six suspects were caught in the same way. "Everybody needs to be entertained, including criminal suspects," joked Cheung. "With our AI technology, this can be done within milliseconds," explained Sun Jianfeng, Product Manager of Intellifusion Inc., an AI company headquartered in Shenzhen in south China's Guangdong Province. "With the great progress of AI algorithms in recent years, the AI technology is much more accurate in visually recognizing human faces than human eyes. This technology has been widely used in many areas in China." Public security is one of the sectors that have seen many breakthroughs in utilizing AI technology. China's security industry started in the 1980s, and has maintained rapid development in recent years, with great demands from the sectors such as city security, transportation and finance. "Thanks to the development of Internet technology, big data and the Internet of things, AI has been widely applied in China's security sector, which helps the police in maintaining public security," said Huang Yu, a journalist of China Economic Herald, who has been following China's AI development for years. Starting in 2015, Intellifusion began to cooperate with the police of Longgang District in Shenzhen to install its AI facial recognition system Shenmu (Deep Eyes) in subway stations, railway stations, communities and supermarkets. Within the first three months after the system was installed in the district, it assisted the police to solve two murder cases. "So far, our system has been installed in more than 20 provinces and municipalities across China, and have assisted the police to solve more than 4,000 cases," said Sun. According to Sun, with the AI system installed in those places, the key facial information on the people who pass these cameras will be captured and sent to the database in the servers. By classifying all these data, the system can quickly differentiate people and provide useful information when needed. "This technology helps improve the work efficiency of the police as it can recognize the wanted suspects among tens of thousands of people and track their movements," said Sun. For example, when a child was kidnapped in the past, the police had to personally watch all the surveillance videos, which usually took time. On many occasions, the police did not know where the child and the kidnapper were going. "But now, our system can search for the child across the whole city and track him or her in real time," said Sun. Last year, the system helped the police in Longgang find a kidnapped child within 15 hours. Besides public security, facial recognition technology is also used in many other areas which makes everyday tasks more convenient, like paying with a smartphone and using banking service. In Qingdao, east China's Shandong Province, Beijing Megvii, an AI company specializing in facial recognition technology application, is helping develop a facial recognition-based paying system for the city's subway. Citizens can register their facial information in the system. When they take the subway, they do not need to buy tickets. The cameras in the subway can recognize them, and they can pay automatically online. "With this system, passengers do not need to stop anywhere when they take the subway," said Zhao Chuanqi, COO of the company. The system is expected to come into service in Qingdao at the end of the year, making the city the first in China where passengers take subway by scanning their faces. Facial recognition is only one part of AI technology that has developed rapidly in China over recent years. 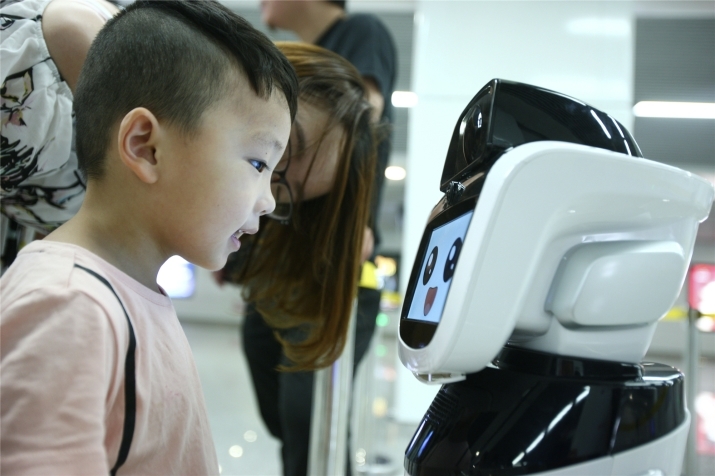 According to the Plan for the Development of the New Generation of Artificial Intelligence issued by the State Council of China on July 8 last year, China has built a solid foundation for AI development. A series of measures and policies have been adopted to encourage AI development in the aspects such as AI R&D, application promotion and industrial development. For instance, China has launched key projects such as Intelligent Manufacturing, and issued a Three-Year Action Plan for the Internet Plus AI in May 2016. According to the Plan for the Development of New Generation of Artificial Intelligence, China's AI development in vocal recognition and visual recognition is ahead of the global pack, and China maintains the capacity to leapfrog development in self-adaptive learning, intuitive sensing, comprehensive reasoning, hybrid intelligence, and swarm intelligence. After years of development, China has created a sound environment for the growth of AI businesses. According to the 2018 Report of AI Development in China issued by the China Institute for Science and Technology Policy at Tsinghua University, by June, the number of AI companies worldwide totaled 4,925, of which 1,011 were on the Chinese mainland, putting China in the second place worldwide, next only to the United States that registered 2,028 AI companies. 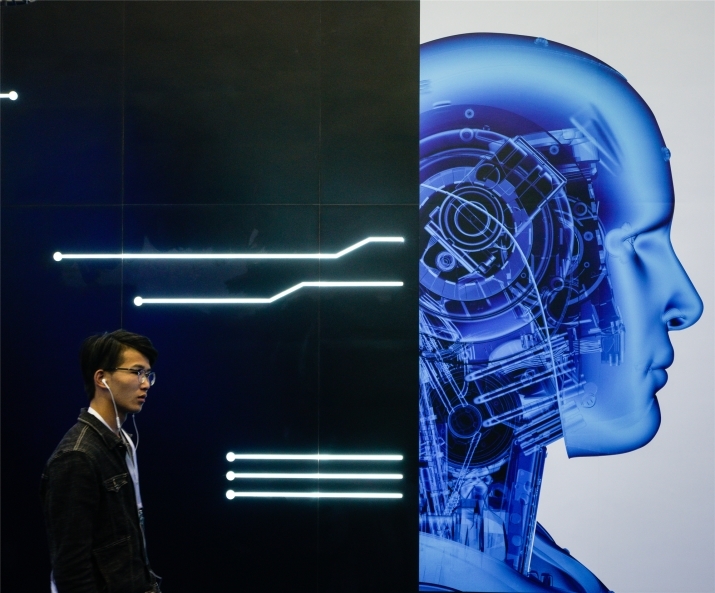 In China, Beijing boasts the largest number of AI companies, reaching 395, far more than other provincial administrative regions. In addition, China ranks No.1 in terms of scientific and technological papers published and the number of AI patents for inventions, according to the report. "In the coming five to 10 years, AI will deeply change our society, our study and life, and the way of operation of every single company," said Jiang Tao, Senior Vice President and Co-founder of iFLYTEK, a leading AI company in China specializing in intelligent speech and language technologies. According to him, with the improvement of AI technology and increased varieties of AI products, people will enjoy a more relaxed, more convenient and easier life. "In the near future, AI will access deep into our life, just like water and electricity." Jiang firmly believes that AI will not replace human beings, but will improve people's lives by being controlled by human beings. According him, although AI can perform tasks like calculating, memorizing and collecting and sorting out data better than humans, it cannot take the place of people making decisions. For instance, in school education where AI is widely applied in China, it is now capable of correcting students' homework, including subjective homework such as compositions, like a teacher. During the process, it can also collect and memorize all homework and examination data of every student. "This data can be analyzed by an AI system according to certain rules and be used for reference by teachers so that they can adapt their teaching methods to suit individual students," said Jiang. "But AI systems cannot decide on behalf of teachers or act as a teacher, as this needs the expertise of human beings." Through a deep learning process, AI systems can only learn to do work with logical rules and can do repetitive work to assist human beings, according to Jiang. Thus, people can have more time do creative, inspiring and imaginative work and work that requires communication and emotion. "Currently, AI systems cannot do this kind of work," Jiang noted. "AI systems and human beings should collaborate to improve people's lives. Just like a car which was invented not for people to compete with it, but to control it, so that people could move faster." Facial recognition works in the same way. In Cheung's concerts, the AI system can spot suspects among tens of thousands of people, but it needs the police's final confirmation. On August 11, Cheung will hold a concert in Dongguan in south China's Guangdong Province. How many more criminals will be arrested?